City group represented India at the International Festival of Drums and Traditional Arts. Five hundred artists from 20 countries and a festival of music that lasted for seven days — that was what the fourth International Festival of Drums and Traditional Arts in Cairo was about. 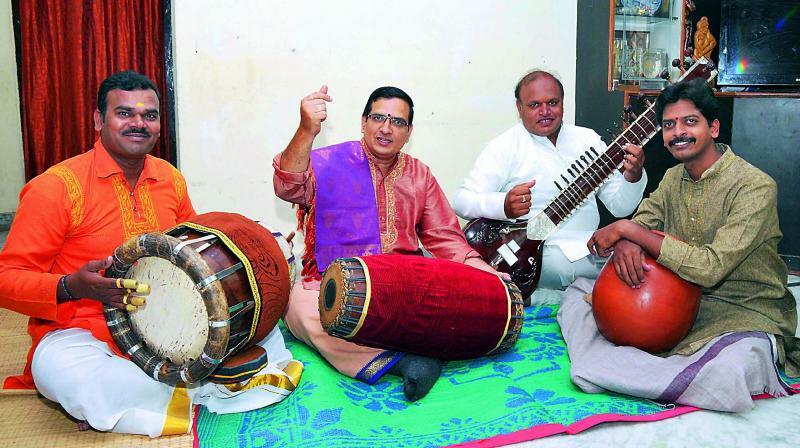 And a group from Hyderabad, Taala Vadya Kacheri, represented India. Headed by mridangam artiste P. Jaya Bhaskar, the group that has been performing since the last 15 years, performed for the first time in this festival. “We were selected by the Indian Council For Cultural Relations to represent India. We performed in some of the most historic places, but the best part about the trip was playing to such a wide audience and meeting artistes from all across the world,” says Jaya Bhaskar. Armed with a mix of Carnatic and Hindustani musical instruments, Taala Vadya Kacheri enthralled the audience with a mix of both genres. “Our percussion ensemble group had the best instruments. We had the mridangam, tabla, thavil, khanjira, ghatam, Carnatic violin and the sitar. Apart from playing at the international festival, we have also played at the famous ‘India by the Nile’ festival,” he adds. The group has been part of several festivals across the world and they believe that it is teamwork that helps them perform best. “We have known each other for the last 15 years. Each member brings to the team a very essential quality and without that, we wouldn’t be able to give such performances,” he says.